Stress and poor well-being cause lost effort and reduced productivity. Failure to tackle stress in staff can lead to management being accused at tribunal of unfair or constructive dismissal and disability discrimination. Awards against management can be substantial. Management of stress and well-being is fundamental to good management. TimelessTime consultants have been responsible for the well-being of hundreds of staff. They’ve run the occupational health function in several organisations. Could we help you and your staff achieve positive well-being? Stress is probably the single most often cited reason for employee absence from work. It causes both long-term and multiple short periods of absence. Both are highly disruptive. Stress is complex. The solution is to have staff cope. Coping is achieved through management action. Management of stress and improved well-being must generally be addressed together. Achieving well-being is complex and specific to the individual. What makes staff physically fit with positive thoughts and beliefs will differ person to person. Well-being is enhanced in each person by the job done. Most jobs and environments can be improved to enhance well-being. Employees express motivation and engagement through positive thoughts and feelings. Managers hope that staff feel positive about the work they do and feel positive about the work environment. Negative thoughts and feelings degrade motivation. Physical wellbeing – being reasonably fit and not ill – helps psychological well-being and helps staff feel good in themselves. Psychological well-being is about having positive thoughts about work and the firm. Positive well-being allows employees to be motivated and to perform well. It is therefore in all managers’ interests to ensure the well-being of all staff. Stress degrades well-being. 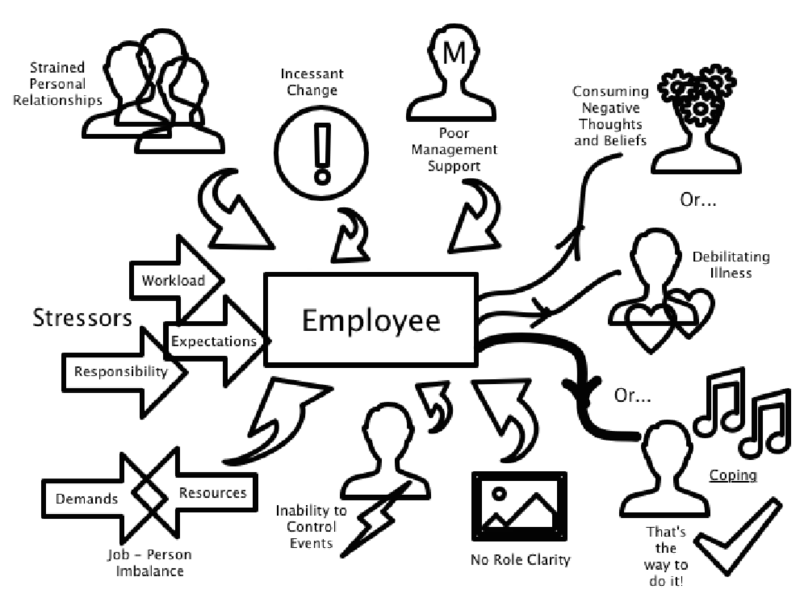 All staff experience stressors. Whether these result in debilitating illness or consuming negative thoughts, or result in coping and even positive energy, depends on six management-related factors. These are shown above as moderators on the employee psychological processes. Whilst coping does depend on many in-person characteristics, it is also hugely influenced by an employee’s manager. Managers need to learn how to manage stress in subordinates.